While we are all familiar with the knitting of many different types of garments, it’s nice to see something knit that’s really different. It’s knitting outside the box if you will! That’s what Amanda’s fantastic knitted jewelry makes me think of. I don’t think non-knitters would recognize this jewelry for what it is, which is also cool. 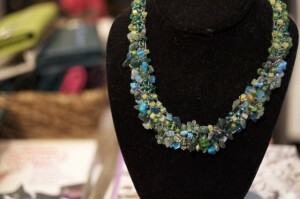 Amanda has some amazing knitted jewelry kits that are available at the shop in really fantastic colour combinations. There are a few different categories of beaded knitting: there are yarns with beads already in them, which lends your knitting a nice random bead quality. 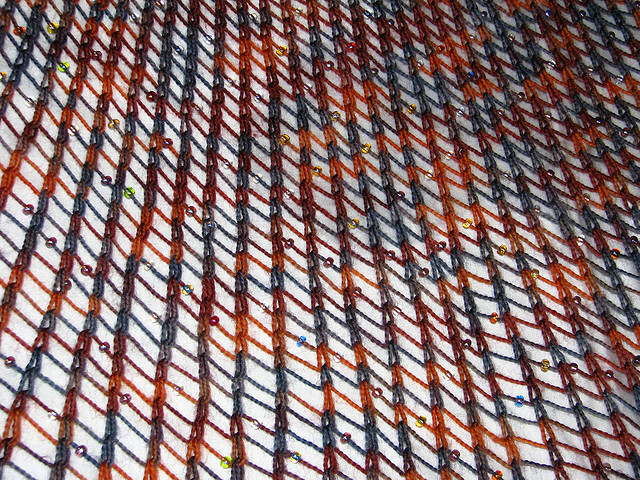 There are also many shawls that involve specific bead placement to varying degrees of beady-ness. The last category is this beautiful knitted jewelry which appears to be almost entirely made of beads, the knitting is almost your little secret. Knitting with beads is a little scary for some but once Amanda gave me a demo I’m feeling a lot less daunted by the task. 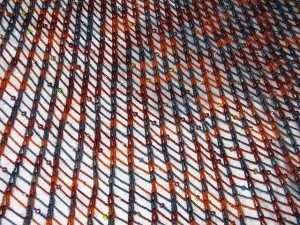 There are 2 different ways of knitting with beads (I suppose there could be more but there are 2 that I know of). The first is the obvious one: string all the beads onto your yarn before you start then move the beads to the needles as you need them. This is not necessarily a bad way to go, the beads lay quite nicely on the stitches this way. The obvious downside? Stringing MANY beads and having to run your yarn through all of them. A while back Anina knit herself up a Shipwreck Shawl and she used this stringing method. 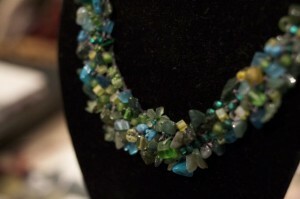 The result was stunning but she was pretty sick of stringing beads by the end. The other method involves a little tiny crochet hook and the bead sits on top of the stitch. This method has it’s clear advantages, you can place the beads as you go without having to string them in any sort of order. This method is definitely convenient for lace knitting and knitting with any sort of fuzzy yarn. Fuzzier yarn doesn’t seem to like going through many beads before meeting it’s final destination on the needles. This entry was posted on Monday, January 24th, 2011 at 11:24 pm	and is filed under Uncategorized. You can follow any responses to this entry through the RSS 2.0 feed. Both comments and pings are currently closed.